Why cover your bird cage? When should I cover my bird cage? 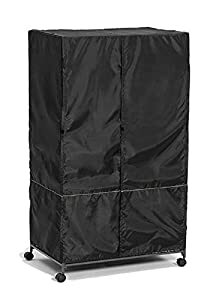 What should I look for in a bird cage cover? Best bird cages cover for your pet! "Mi casa es tu casa" is a Hispanic saying that literally translates as “My home is your home”. We love to be a good hostess to our friends, but, we pet lovers want to be especially accommodating towards our dear pets. Bird lovers may have it tougher than the rest, as birds have specific needs that must be met in order to favor a long, healthy and happy life. To find an appropriate cage for your feathery friend, with the right size, material, and toys is just the start. Plenty of bird owners fail to see the importance of one accessory: The birdcage cover. It may sound like a whim, but, bird cages cover is not unnecessary at all. If anything it improves your pet bird wellbeing by much, here at Pet Comments we’ll share with you the reason why bird cages covers are necessary for your pet health and wellbeing, how it will increase their comfort, the best cages cover in the market and other important factors to consider. Speaking a bit about birds’ natural habitat: The wild, where do they sleep? Depending on the species, birds have different habits, yet, we can find a common behavior when looking for shelter. Many bird species sleep in holes in trees, called nest cavity. If a bird doesn’t find a nest cavity in a tree they will simply make one out of dead trees. The smarter ones are very opportunistic; if they discover an abandoned nest cavity they will make it their own and even personalize it. The nest cavity protects the bird and eggs at night from predators and natural elements like rain and wind, is dark on the inside and perfect to put eggs. In captivity, as accommodating as you want to be with your bird, you will scarcely have a tree with a nest cavity inside your home where you can see, play, take care and basically interact with your bird (unless you are super wealthy, lucky you!). If you have a modest budget, don’t worry, we got you covered. Bird pet owners can replicate the feeling of the nest cavity in captivity with the help of the cage cover. It will make your bird feel safe and truthfully protect it from elements like windy spaces, artificial decorative lights and so on. Is useful to remember that the cage is not just a cage, is your bird home and you should accommodate it like that. The cage is the safe space where your bird can play and interact with you; the cage cover transforms it into a huge nest cavity for them to rest. It helps them sleep longer. People are supposed to sleep a good and solid 8 hours at night to properly function every day. Birds are similar; some bird species require a nice and long 12-hour sleep to stay happy and healthy. The cage cover helps them regulate their sleep. For example. While people may already be awake and doing noises around the house early in the morning, the birdcage is still covered your bird will still be sleeping as the cage cover signals them is still night time for them for what they are still sleeping. Of course you must remove the cover once those precious 12 hours are over. Too much breeze or air currents can harm your bird by bringing more dirt and dust into their cage. Air flows at night also interrupt your bird sleep. This can be easily fixed with a cage cover. It keeps their “house” cozy. Many houses today have an air conditioner and especially in winter, your bird will probably feel cold. Beside this, unless you have a huge macaw at home, birds are not big enough to create sufficient body heat for them. To cover their cages is practically giving them a blanket to stay warm at night, even in tropical areas; birds tend to feel cold at night. People that already have birds would have probably noticed how birds can get scared or startled over pretty much anything at night. Cockatiels are an example of this. In the wild, these birds are wary of depredators, whatever that looks or even sound like a depredator will scare them out. 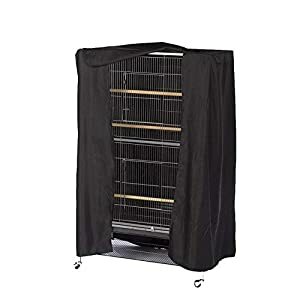 The cage cover, again, functions like a security blanket that blocks noises and covers any “suspicious” movement that could potentially scare your bird or give them a hard time trying to sleep. To protect your bird from night frights is kind for them and good for their mental health, a bird that constantly has night frights will forever be anxious. Just like people, birds need a proper environment to get a good rest (who can sleep with the lights on anyway?). If the space designated for the birdcage is too shiny, light from other bedrooms or the neighbor house lights filtrates into space where the birdcage is, cover the cage to protect your bird from the unwanted light to favor uninterrupted sleep. Be observant. If your bird is overly vocal at night, is anxious, depressed even, it might not be resting well. Cover their cage at night to give your bird pet its precious 12 hours sleep and watch the changes. If your bird looks happier and less anxious you are doing it right. Warning. NEVER use the cage cover as a punishment to your bird, like covering their cage whenever it’s being too noisy. This will confuse your bird, affecting its mental health which is potentially harmful to your pet. Pet birds are social animals that need to interact with you often; to seclude them in the cage cover out of their time of sleep won’t help them stay happy at all. The bird will become anxious, stressed and depressed, provoking self-destructive behavior. The cage cover must be your bird security blanket at night and nothing more than that. 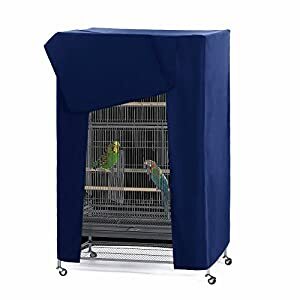 On the other side, if the cage cover makes your bird anxious, scared or starts picking at the cover it probably means your bird has been covered for too long. The cage cover material or fabric. This cover will literally be the “walls” of your bird’s cage; therefore, make sure is made of a “breathable” material. The cage cover is supposed to provide warmth and protection but not to asphyxiate your bird. Besides, the cage cover must block all light from outside the cage to ensure a peaceful sleep. Bird cages come in different sizes and designs, depending on your bird size or number of birds in the cage, you can have a small, medium or a rather large cage. Independently of your bird cage size and design, the cover must be a reasonable fit. It can’t be smaller than the cage or it won’t completely block light, or larger than the cage making it troublesome to cover your birdcage every night. Bird cages cover is often design with practicality in mind, simple and easy to put and retrieve. Choose the one you can machine wash for your own and your bird pet comfort. Keep a good cleaning regimen of your birdcage and birdcage cover. Good maintenance will make this item last longer and give your bird a healthy living environment. 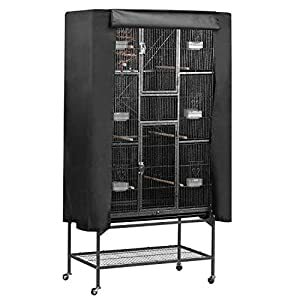 Fortunately, taking into account all the specifics you may need for your bird buddy comfort, we have made a list of the most wanted bird cages cover for you to check out. The “Heitaisi” birdcage cover is the epitome of simple and practical! This bird cage cover was designed to adjust to a universal bird cage. The front cover can be lifted up easily to meet your pet bird needs and let light enter into the cage if need it. The “Heitaisi” birdcage cover is not only practical but it’s also completely safe for your pet. It is made of high-quality materials that are non-toxic and breathable; Therefore, there is no health risk for your bird. The fabric is of lightweight and machine washable making maintenance and cleaning duties easier for you. Available in two sizes, the small one is 18 inches large, 18 inches wide and 25 inches of height. The large one is 31 inches large, 21 inches wide and has 41 inches of height. Blocks more than 90% of sunlight and UV rays providing a dark area for your bird to sleep. High-quality materials, breathable, non- toxic and machine washable. Pony Dance universal bird cover was designed with your pet bird comfort in mind. This cage cover is made out of a thick, resistant, non-toxic, yet, breathable material. Its size accommodates universal bird cages. It fits a rectangular cage shape, surely, useful for other types of cages. The Pony Dance birdcage cover measures 21 inches large, 21 inches wide and 28 inches of height. 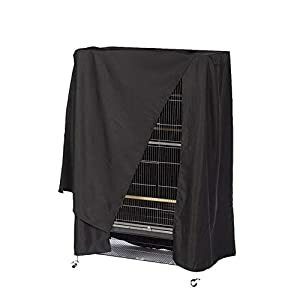 The front of the cage cover was made to be put up or down according to your bird necessity, leave the cover down for a calm, silent and cozy night sleep and lift it up to announce a brand new day to your birdy friend. Easy to put and retrieve. Covers 90% of the sunlight and UV rays, providing comfy, serene nights for your bird. Unlike the previous ones in the list, this cover was designed for a ferret cage, still, the measurements of the cover are the correct ones for a bird cage cover too. The cover was designed to fit the “MidWest Ferret Nation” models 142,182 and “Citter Nation” model 162. If you happen to own these cage models, this cover is a secure bet! It measures 36 inches large, 24 inches wide and 58.5 inches of height. The Ferret Nation and Critter Nation cage cover promotes relaxation and reduces anxiety for any small animal inside the cage. The cage cover is made out of black polyester, microfiber inside and out of the cover. Exactly like a blanket fabric! Is machine washable and drier friendly. Super easy to maintain clean. Like the previous in the list, the front of the cage cover is designed to be lifted in order to meet the pet needs. The Ferret Nation and Critter Nation cage cover come with velcro straps that ensure once you lift the front it will stay attached to the velcro straps. 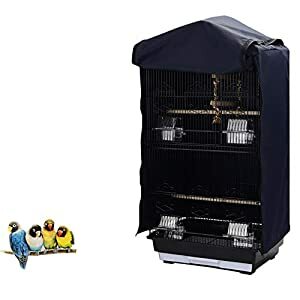 This cage cover won’t’ only keep your bird comfortable at night, it will also make easier for you to take care of your bird pet. It comes with hooks and loops tabs to secure the cover will stay in place. It is made out of a breathable material. Machine wash and drier friendly, it will not shrink with hot air or water. Since it was designed for a Ferret Nation and Critter nation cage model in specific, you will have to check if the measurements match your bird cage. The “Foreverwen” birdcage cover has a good price for what it offers. Protect your bird sleep hours with the “Foreverwen” bird cage cover. This cover is designed for rectangular cages; the front can be lifted up to meet your pet bird needs and adjust the light into the cage. The cover is made of non-toxic and breathable material for your bird's safety. The fabric is of lightweight and machine washable. It is available in two sizes: Large and small. The small one is 18 inches large, 18 inches wide and has 25 inches of height. The large one is 31 inches large, 21 inches wide and 41 inches in height. Remember to check your bird’s cage measurement so you won’t get a too small or too large cover. It blocks more than 90% of sunlight and UV rays leaving the inside of your bird cage dark enough to favor a good rest. Machine washable, non-toxic and breathable. Since the fabric is lightweight it may not protect your bird from a noisy environment. The “Yaheetech” cage cover was designed with a rather large cage in mind, is made of durable materials that make the inside of the cage dark enough for your bird to sleep even if the area where the cage is isn’t dark enough. It has a front flap design to allow light and air to enter the cage. When completely closed, it protects the cage from wind, dust, and cold air making it especially useful in the winter season. The cage cover is 41.3 inches large, 27.6 inches wide and lastly 48 inches of height. Check your bird cage measurements for extra precautions. 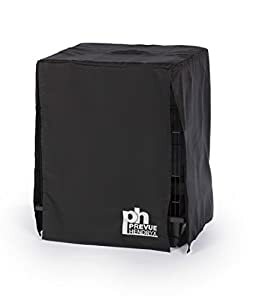 A bonus point this cage cover has is that is waterproof, in case your bird cage is not completely cover from the elements, the “Yaheetech” cover will most definitely protect the cage and your pet bird. It protects the inside of the cage from dust, wind and keeps your bird warm. Made of durable non-toxic material. Front flap design for you to check your bird without lifting the entire cover. The material is not breathable, so there is a high chance that your pet bird will be lacking enough air. The cage cover is not machine washable. Prevue has the right cage cover for your medium size bird cage. Plenty of happy customers make it one of the top choices in bird cage covers! The “Prevue” birdcage cover provides a dark and calm environment for your bird to sleep. It is made out of non-toxic materials that are also breathable so it won’t threaten your bird's health. The cover has a simple design, easy to fit in your bird's cage, colorfast and machine washable. This cover does not work well with hanging cages since it was not designed for it. The front of the cover is not attached to the sides of the cover allowing you to roll it up and check on your bird if need it. The “Prevue” cage cover is definitely the option for the small birds’ owners. 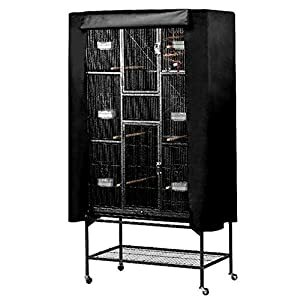 The cover fits cages up to 20 inches large, 20 inches wide and 29 inches of height. Made of non-toxic materials and breathable. It has a handle on the top and is easy to wash.
Front flap allows you to check on your pet bird. The material is too thin to offer enough protection in winter. The “Skroutz deals” cage cover goal is to guarantee your bird rest secure and peacefully. It’s simple yet practical design protects your bird from windy spaces and dust. Artificial lights and natural sunlight won’t be a problem for your bird anymore as the cage cover it’s made of a thick, resistant material that shuts out the majority of the light and diminish noises that could wake your bird. The front flap can be opened without lifting the whole cover for you to check on your birds. The front cover measures 33 inches wide and 48 inches in height. The actual dimension of the whole cover is 41.3 inches large, 27.6 inches wide and 48 inches of height. It is made out of resistant material. Simple and practical design, easy to put and retrieve. The cover thick material offers protection against wind, dust and secures warm nights for your bird. The “QBLEEV” birdcage cover creates a secure calming space for your bird to rest. Like the other models in this list, the “QBLEEV” front cover was designed to be lifted if needed without completely removing the cover. The cover fits cages up to 18.5 inches large, 14.1 inches wide and 35.4 inches of height. For your bird night time, the cage cover front comes with zippers to ensure it will remain closed and no light will enter your bird cage. With the zippers securing the cover folds, no wind or light will interrupt your precious bird buddy sleep. It is made of durable, non-toxic and breathable fabric. Therefore, the cover won’t only give serenity to your pet but it will also protect it without harming it. Zippers in the front cover that ensure no light will enter the birdcage. Keeps your bird warm by retaining heat. This universal cage cover works for almost any type of cage, is the perfect option for the busy owner that rather prefer to keep things simple but effective. This bird cage cover is made out of breathable, non-toxic material, lightweight and machine washable. The cover itself is simple but neatly stitched so you won't have to worry about the fabric becoming threaded. It comes in two sizes, small and large. The small size fits cages of 18 inches large, 18 inches wide and 25 inches of height. The big one fit cages up to 31 inches large, 21 inches wide and 41 inches of height. The front cover can be easily lifted up in order to check on your birds as needed without entirely retiring the cage cover. Blocks more than 90% of sunlight and UV rays. The front cover is not stitched to the sides allowing you to check on your birds if necessary. The material is too thin to offer warm in colder weather. We simply cannot stop worrying over our dear pets’ wellbeing. Securing a peaceful, warm and secure rest for our pets is part of it. When choosing one cage cover for your birdcage remember to have many factors in mind. Make sure the cover you choose fits your bird cage just fine, if you are feeling doubtful, pick a slightly larger one. Is best to have a larger one and cut a bit from it later than a shorter one that won’t fully protect your bird. Always make sure the materials of the cage cover are non-toxic and breathable. Do you live in tropical weather? Or is it cold most of the time? Just like people, birds feel cold at night. Make sure to pick a cage cover that fulfills the needs of your bird according to the weather. We sincerely hope the previous list proves to be useful for you and your pet bird. Keep in mind the previous advice and you will be ready to go “cage cover hunting”.